Building Area: 7,500 sq. 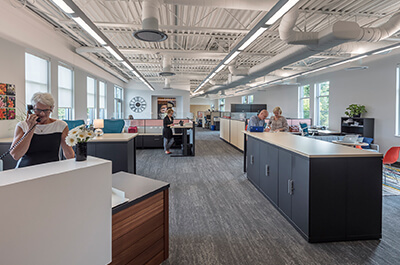 ft.
With the growing enrollment of its elementary school, Grand Rapids Christian Schools needed to find a new home for its administrative offices. For those involved, it was an opportunity not simply to relocate, but also re-imagine how the space could function. 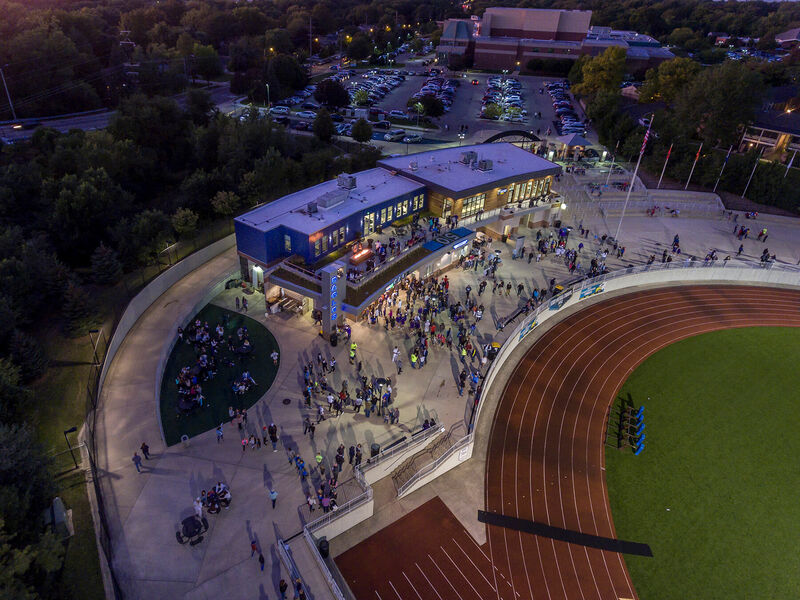 After a formal vetting process, the school system came up with a novel idea: build a space overlooking the high school athletic stadium. The plan was to add a second floor to the existing concession and locker room facility. To see if this was even possible, the schools engaged its design partner of more than a decade—AMDG. AMDG utilized 3D survey technology to confirm the existing structure could carry the weight of a second story. The design team also found ways to create open plan offices within the confines of the building’s existing exterior walls. For those who use the space, the open, airy offices are a welcome change of pace. Being more visible was a key consideration for school administrators. Today, the facility is a focal point for everything from professional development to faculty dinners. The added 15 feet of structure gives visitors views of the stadium, while also serving to define the courtyard below. AMDG collaborated closely with Rockford Construction to ensure the project remained on track. The careful planning paid off with the new space coming in on budget and within the desired timeframe. Featured prominently at the entrance, Kayu wood siding brings warmth to the exterior. Inspiration for the material came from a member of the GRCS community who wanted the building to have a welcoming spirit. 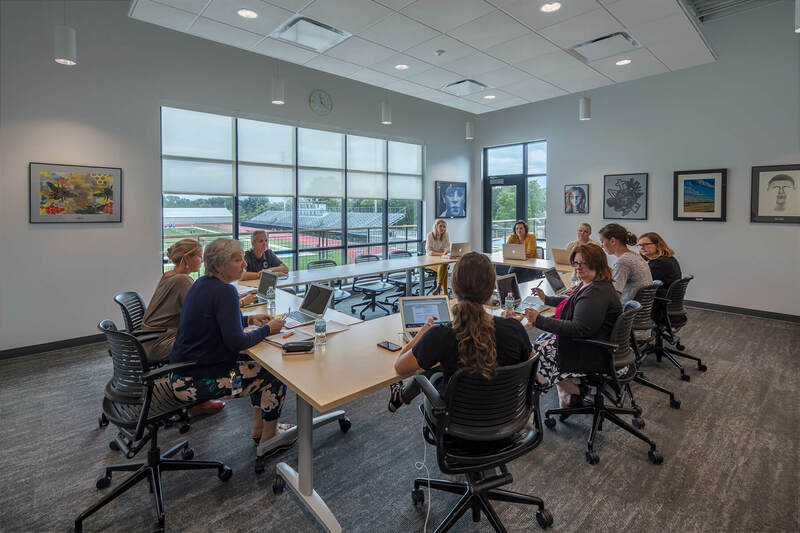 When a trusted member of the GRCS community suggested expanding the vision of the facility beyond its administrative function, AMDG pivoted quickly, expanding upon the design plan. 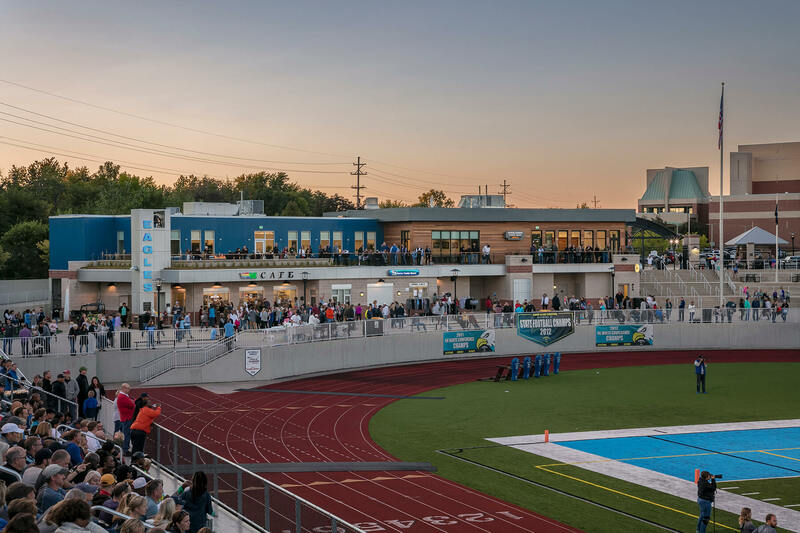 The added 1,200 square foot multipurpose space is ideal for meetings, training, and fundraising events overlooking a packed stadium on game nights. Though it functions as it was intended, what stands out about the new space is how much more it accomplishes. The schools now have a dedicated, tech-rich space ideal for district-wide meetings, professional development, and community events. Meanwhile, alums and donors look forward to game nights on the roof deck. The space is open, filled with natural light, and equipped with spectacular views. 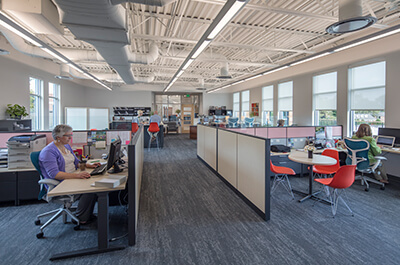 More than an administrative office, the space is a central hub for the entire school system. A place where any Eagle can feel right at home.